The Global Lives Project–a collaboratively produced video library of life experience around the world–has emerged in the past few years as an ideal educational tool to do just this. Global Lives exhibits showcase unedited footage of daily life around the world, and they encourage students and teachers to study, discuss and reflect upon the startling differences and similarities between people from around the world. Global Lives started as a collaborative work of video art, eventually growing to include more than 2,000 collaborators from around the world. In 2010, a group of Muslim teachers from Indonesia’s National Teacher’s Association drew up the first outline of a curriculum to bring Global Lives into classrooms around the world. The teachers were captivated by video footage from around the world that was freely available to them and subtitled in Indonesian. Filmmaker Khairani Barokka leads a session at the National Teacher’s Association of Indonesia Conference about the Global Lives Project. Global Lives quickly became an educational “moonshot” (the subject of my book,Moonshots in Education) using cutting-edge technology to bring blended learning of “non-cognitive” skills, most specifically, empathy, to the center of schools and classrooms. 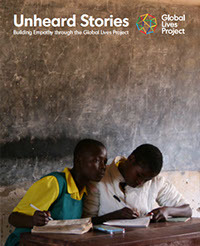 The lessons in Unheard Stories walk students through the process of understanding themselves and their own identities and then breaking down barriers to the understanding of others. Each lesson uses segments of the Global Lives videos, like the ones above and below featuring students from Lebanon and Malawi, to illustrate the lessons. These kinds of measurable impacts–building a culture of global empathy–are a strong positive indication that new approaches to education and media arts can shape a more inclusive world. By learning to respect people regardless of their race, ethnicity, religion, gender or nationality, we have the opportunity to inoculate future generations against the attitudes that created the cycle of war and terror currently plaguing us. If you’re a teacher, or you know one, you can download the Global Lives curriculum for free today and request an exhibit at your school. You can also join me this holiday season and pitch in financially to build the work of the Global Lives Project–a tiny organization with incredible reach–by making a gift to Global Lives today and bringing exhibits and curriculum to more schools around the world.